Charles A. Halbert Public Library visitors enjoy displays about "African Survivals in St. Kitts and Nevis." Percival Hanley, Chairman of the History and Heritage Committee and General Manager of the Brimstone Hill Fortress National Park Society, said the theme was chosen to highlight the importance and existence of various aspects that have been inherited over the years from the island’s African ancestors. Charles A. Halbert Library Representative on the History and Heritage Committee, Denise Welsh, said that every month a different display is presented to highlight each month’s theme. 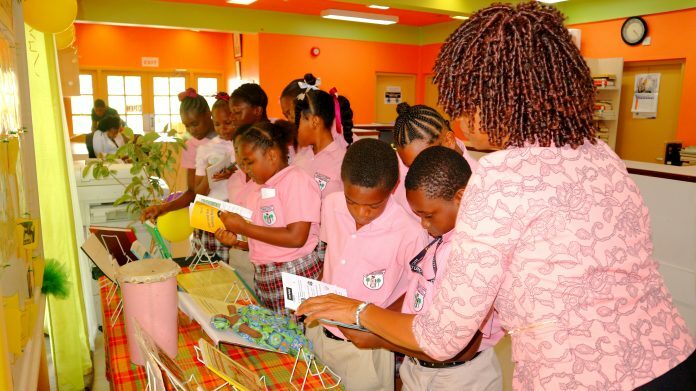 “For several years, we have partnered with the St. Kitts-Nevis History and Heritage Committee to present our display for the February History and Heritage Month,” said Mrs. Welsh. “The display features write-ups, books based on African heritage and paraphernalia focused on the “African Survivals” theme. “The History and Heritage Committee coined the term African Survivals to depict aspects of the country’s African heritage such as dance, drama, art and craft, music, local customs, local sayings and herbal medicines. According to Hanley, History and Heritage Month in St. Kitts and Nevis was founded by the late Sir Probyn Inniss. It began as a week and then expanded into a month to promote awareness and understanding of the Federation’s history, heritage and culture among citizens and to create a sense of pride within them.